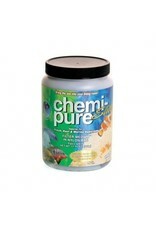 Aquaria (P) BE CHEMI PURE ELITE 11.74OZ - Rick's Pet Stores Inc. Availability: Temporarily out of stock, Please continue to order. Products are usually restocked weekly. 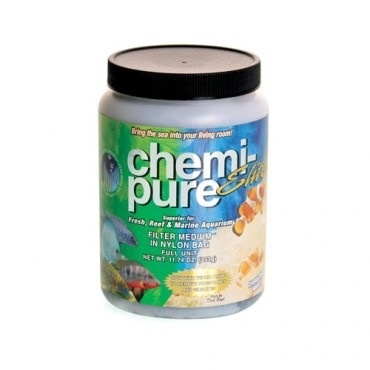 Great for freshwater, marine, and reef aquaria, Boyd Chemi-Pure Elite is a specially formulated chemical absorption filter medium, ion generator, and exchange unit. This safe and effective filter media helps: create crystal clear aquarium water, stabilize pH levels, reduce frequency of required water changes, promote aerobic bacterial growth, remove dissolved organics, and much more! This powerful agent also contains Ferric Oxide to remove phosphates and silicates. Chemi-Pure Elite is a multi-functional filter media that will offer countless benefits to your custom aquatic domain and all of its precious inhabitants. Suitable for aquariums up to 40 gallons is size. Use as directed.